Find the best gym floors for indoor and outdoor basketball courts. Compare the pros and cons of a variety of sports flooring options so you can select the best option for your home court. Dirt courts are hard to play on. If it's your only choice, it's better than nothing, but I don't like playing on dirt at all. It's really hard to get good traction, the ball bounces unevenly and inconsistently, and most dirt courts have irregularities since it's hard to find one that's perfectly level and smooth. Asphalt basketball courts are tough on the legs and HOT during the summers we have in South Texas. I used to coach elementary kids, and all we had to play on was an outdoor parking lot made out of asphalt. Asphalt makes a very rough surface and as it wears, it cracks and exposes little rocks that can cause really ugly injuries when kids fall. I always held my breath any time a youngster took off running because I anticipated a bad spill. Concrete surfaces make for nice even bounces, but they're really hard on the joints and painful when you take a hard fall. Carpet makes good multi-purpose gym floors if you have a limited budget, but it also has its drawbacks. My church had a carpeted multi-purpose floor that served as a sanctuary on Sunday mornings and a basketball court on Saturday afternoons. Though it certainly allowed maximum versatility of the building, the court really hurt my knees, and if you've ever had a carpet burn, you know that falls aren't much fun. There's a reason wood is the most popular sports flooring for competition basketball courts. They are by far my favorite playing surface as long as they're kept clean and are well constructed. When wood courts are allowed to get dirty or wet they become very slippery, and if they get too wet, the wood can warp and become uneven. If not laid properly, wood floors can have dead spots. Generically known as "sport courts," this type of basketball flooring can be both great to play on and terrible. I've played on some high-quality sport courts that performed very well, and I've played on some cheaper versions that I didn't like at all. It really depends on the quality of the contruction. Some sport court gym floors have very poor traction and poor resilience making it hard to dribble consistently, impossible to make good basketball cuts, and difficult to jump very well. They can also get very slippery when wet. On the other hand, I've competed on some that were really nice to play on. 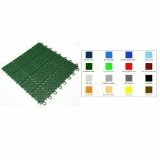 Many of the sport courts are built with an Interlocking Plastic Tile System. These gym floors actually come in tile pieces that fit together like a puzzle. For further information, Signature Sports Flooring has a good description of the different basketball flooring options. The Interlocking Pastic Tile Systems are very popular for backyard basketball courts. I've provided links to some of the leaders in the sports flooring industry that you might want to check out. Each of these experts provide a lot of information within their pages about the different flooring options available for both outdoor and indoor surfaces. Most of them have a page that allows you to design your own court by specifying everything from the basketball court size, to basketball court layout, to colors, to accessories. You might also want to check out their Frequently Asked Questions which I have found provide some really helpful information. Before you buy sports flooring for your outdoor basketball court, read Gym Floors: 12 Things You Need to Consider.